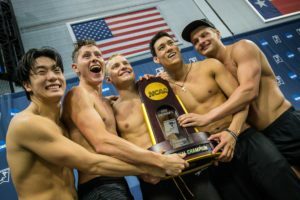 The official psych sheets for the Men’s NCAAs have been released, and with it 235 swimmers from 45 Division I teams have earned invites to the meet. Included in those is a list of 11 mid-major schools with at least one qualifier. We’re counting mid-major programs as those Division I programs outside of the Power 5 conferences (ACC, Big Ten, Big 12, Pac-12, SEC). 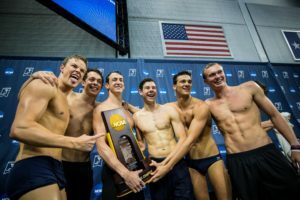 While not all teams in the Power 5 conferences receive the same funding, our goal here is introduce you to swimmers from some of the other schools that might not be as familiar to the mainstream swimming fan. 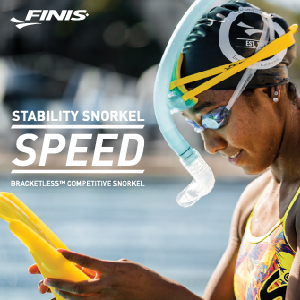 Another reminder: the numbers used in this post only contain swimmers, divers just finished their qualifying process but are not included in these numbers. Harvard is leading the way for these mid-major schools, having qualified 6 individual swimmers and all 5 relays. Dean Farris (junior) is leading the way for the Crimson, sitting as the 2nd seed in the 100 free, 3rd seed in the 100 back, and is seeded low in the 50 free, but was a B finalist in that event last year. 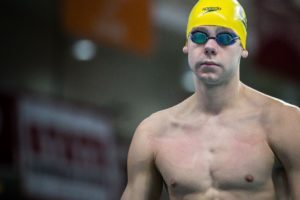 If Farris manages to win one of his events, he will be the first NCAA swimming champion to come from a mid-major program since 2016, when Penn’s Chris Swanson won the 1650. Harvard originally had 5 swimmers earn invites to NCAAs, but Raphael Marcoux just got bumped in when Texas had to cut two of their swimmers to comply with team size rules for the meet, bringing the Harvard total up to 6 entrants. Harvard’s other qualifiers were senior Brennan Novak, senior Logan Houck, sophomore Michael Zarian, and freshman Umitcan Gures. Novak earned invites in two events: the 500 free and 1650 free. Houck also made the 1650, while Zarian made the 400 IM, and Gures made the 100 fly. 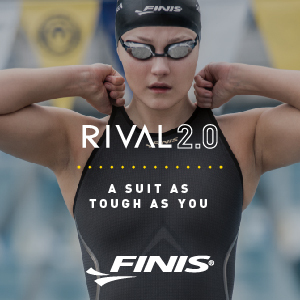 Reminder: every swimmer invited to the NCAA Championships is then able to swim a total of 3 individual events, provided they have the NCAA ‘B’ qualifying standard in the event. 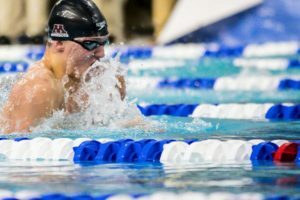 Despite the men’s meet being smaller than the women’s meet, qualifying relays is the one area where the mid-major men outdid the mid-major women. For the women’s meet, only Akron qualified relays, earning a total of 4 relay invites. The men’s mid-majors qualified a total of 10 relays between Harvard, Grand Canyon, and Hawaii. Harvard again led the way here, getting all 5 of their relays to the meet. Furthermore, Harvard is seeded to score in the 800 free relay, while Grand Canyon is seeded to score in the 200 free relay. There were six mid-major swimmers that earned invites in more than one event. There were two swimmers in that group that earned invites in the maximum 3 events. Princeton freshman Raunak Khosla, earned invites in three events. 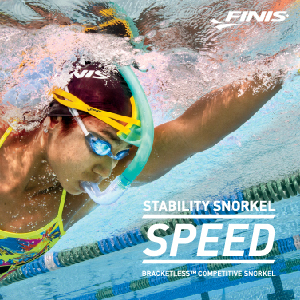 Khosla was invited in the 200 IM, 400 IM, and 200 fly. 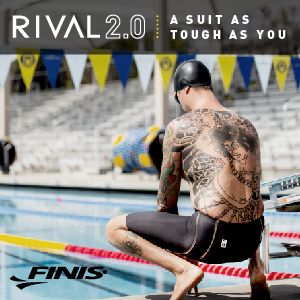 He is seeded 12th in the 200 IM, and 17th, just one place outside of scoring, in the 400 IM. Grand Canyon senior Mark Nikolaev was invited in the 200 IM, 100 back, and 200 back. Nikolaev is seeded 2nd in the 100 back. Great article, love seeing the smaller schools getting representation in the big dance! Small note: it’s Harvard Crimson, not crimson tide 😉 a certain school down in Bama took that one. Nice article, thanks! I’ll be cheering for these guys! Any idea how the number of qualifiers from Mid-major programs compares to recent years?